This is my brand new Irish Promise Necklace now available in my online store: www.RicksonJewellery.etsy.com. Here I would like to show you how I made it, painstakingly I might add. 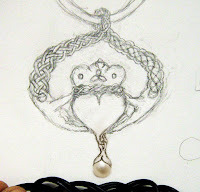 The Celtic love knot for the arms was sooo challenging! But I love a challenge and the end result was so satisfying! So I start with a drawing. My client gave me a drawing and I worked with it till we found something we both liked. I then traced the image with tracing paper, cut it out and use it as a template to then trace/scratch the basic shape into a sheet of green wax. Then I had the challenge of the Celtic love knot! Wow this was hard! I spent an hour or so just scratching the pattern in to the wax, but I couldn't get it to show! 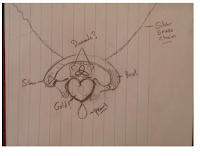 I would look at it under the loop (magnifying glass for jewelers) and could see the design, but couldn't see it with the naked eye. Finally I jumped in with the wax pen and delicately added strands of wax where I had carved the pattern and bingo! I got it. And I was so happy! I am just overwhelmed with how perfect it looks! Ya! Anyways, from there I was home free. I set the diamonds right in the wax because you can do something called 'Stone in casting' with diamonds and other hard stones that can withstand the heat of the molten metal rushing round them. But you need to use high quality diamonds or they might crack. After casting the piece in silver I clean it up with a variety of tools, going from course grit to fine, and to polish with a pink wheel. 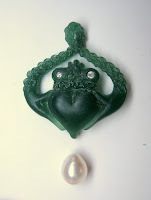 I also glued the fresh water pearl with 5 minute epoxy, and wonderful glue used in jewellery production. And Voila! A beautiful hand crafted traditional Irish Claddagh pendant. Rickson, for those metal 'fabricators' who think wax carving is easier, I say "snap'".....wowza....that be some incredible carving chops, Girl!...amazing piece! Maybe I will just coat it in resin...I have before, so satisfying, but not as 'eternal' as metal....hmm, maybe that's ok.